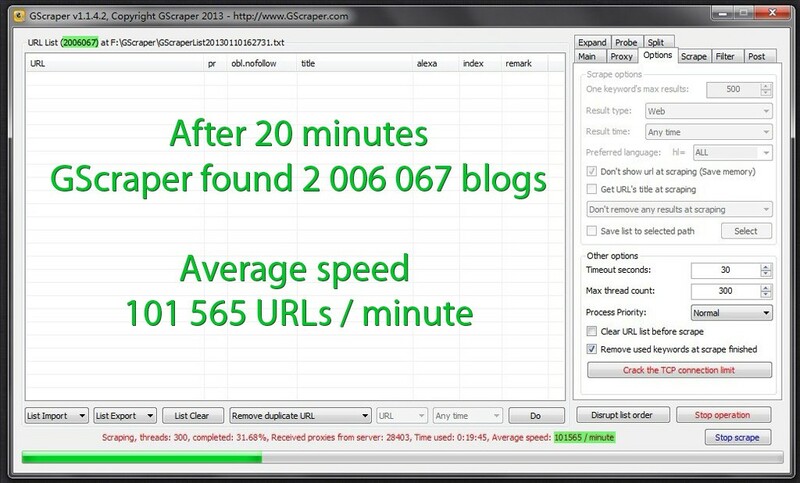 Get thousands proxies in seconds! No more worrying about proxies with Gscraper virtually unlimited proxies are just a click away! So cool, so easy. Proxies donn't get banned! What Makes This Proxy Service Special? We have over 30 dedicated servers using powerful proxies scanning software to scan proxies from around the world 24-7. We allow to each proxy to be used only once which greatly reduces bans and bad proxies. The proxies are checked and saved in our large database where they wait for a one time job. Our proxies are 100% Google passed and can be used to harvest with highest speed. 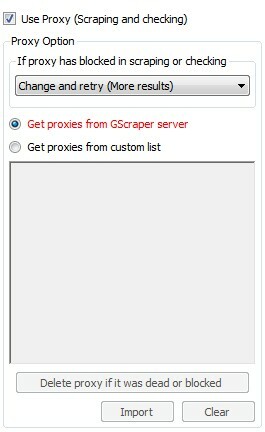 You are also free to use your own proxies with Gscraper. We have a "change and retry" option for if your proxies are banned during scraping. In our testing, this has shown to get much more results from this same footprints. You can also ADD or CHANGE proxies while the program is scraping to keep harvesting with maximum efficiency! Scrape based on the type, time, language and more! 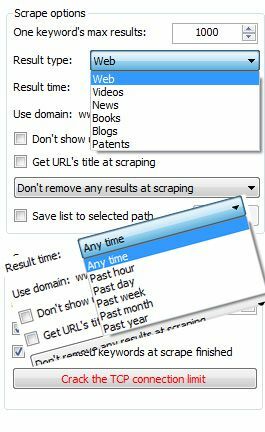 You can scrape for the type, language and time you need - most Google operators are included in to GScraper so you can squeeze every last URL our of your footprints. You can finally harvest the most exclusive lists and post to places which haven't already been spammed to death by everyone else. Gscraper is suitable for all skill sets. 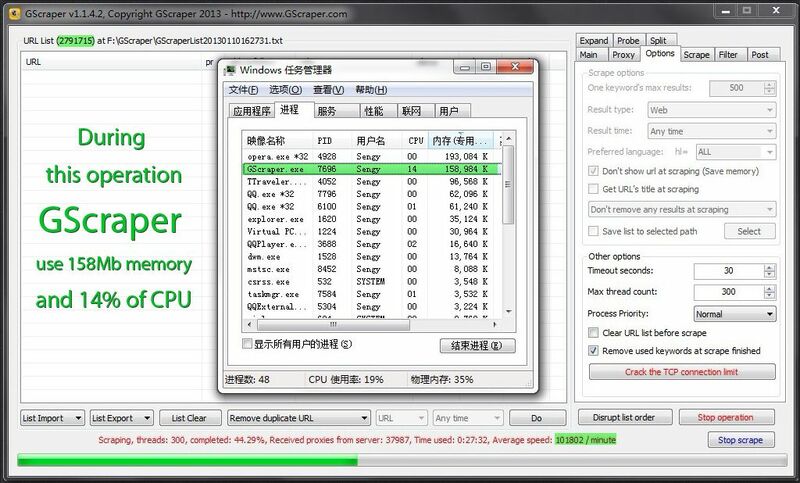 If you are a more advanced user, you will soon realize the full power of GScraper. If you are just starting on your SEO adventure then we will show you how to scrape own lists instead of buying them. For Example: You need the blogs to post comments on? No problem. 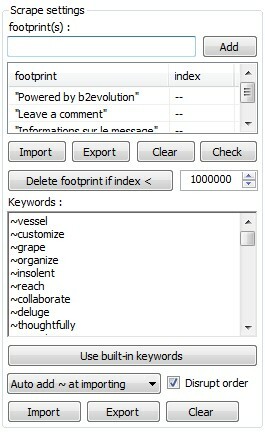 Just select the blogs type and input "comment" in the footprint area. It's really easy! We even include a huge list of most common English words to merge with your footprints, so you don't have to worry about scraping keywords. Are you tired of filling single-line footprints? Don't Worry! GScraper is coming to the rescue! You can IMPORT any footprints list in all of the common formats. Even if the lists are rather large. 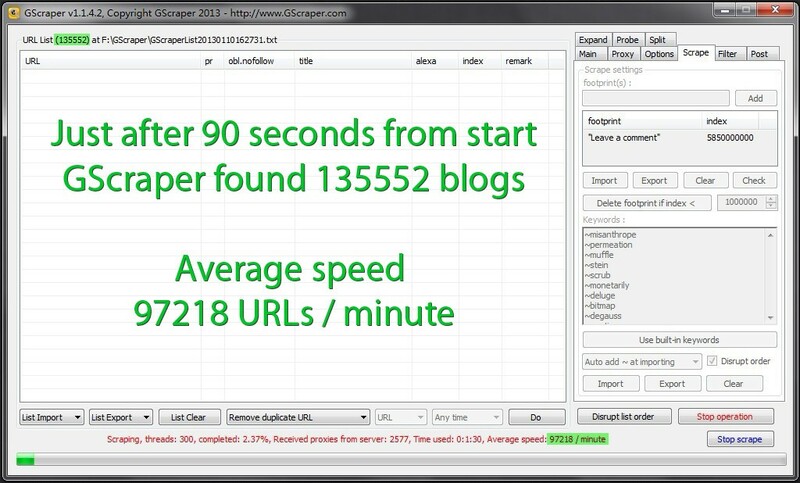 GScraper can mix them with your keywords and scrape huge amounts of data with incredible speed. When mixing keywords you can choose how the footprint should look. You can use operator %KW% to replace part of footprint with a keyword from your list. For Example: When Your footprint is "%KW% inurl:register.php" and keyword "Blog" that means: "Blog inurl:register.php" will be used as your footprint. If You don't use %KW% operator, "inurl:register.php Blog" will be used as your footprint. They are two means to the same end. Gscraper easily works with large lists. 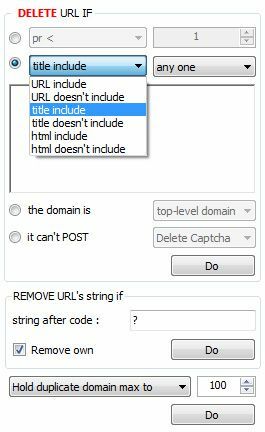 It can remove duplicate URLs, domains, root domains etc. It removes the IP domain URL and the root domain URL. It can trim to root, top domain or last path. It can also check PR, OBL, Title, Alexa and results index status. You can mix your list, EXPORT it as a URLs list or csv list with information about PR, Follow/Nofollow status, Alexa, OBL, etc. It is super easy to sort lists and prepare them for your SEO campaigns or even for sale. For example, you can select a URL or domain to check PR or find out if the URL is visible in the SERPs in a selected time range. You can filter the lists in many ways depending on your needs. When you check the OBL (Out Bound Links) and title, you will notice two values in OBL field. On the left is the total OBL count and on the right is the nofollow count in OBL. 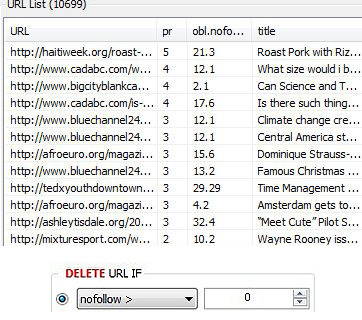 With one click you can filter your list to keep only valuable do-follow links from non-spammed websites. 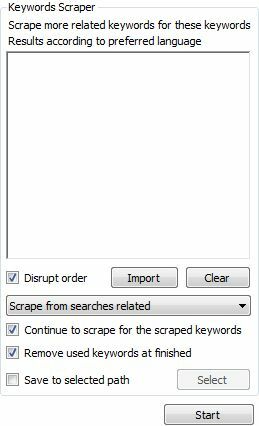 GScraper can delete the URL(s) when PR, OBL, nofollow, Alexa results are less or more than what you set it to. 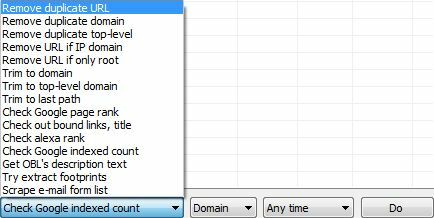 It can also, delete the URL(s) when URL, title, html source include or don't include any one or all of the text lines/strings. As you can see, it can also delete the top-level or sub domain's URL. If you want to filter only blogs where a form is available you can do that with just one click. 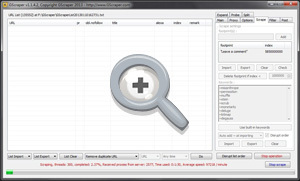 GScraper will help you to determine where posting is possible. You can also keep only the forms that don't require a captcha. Imagine how this will improve your success rate! 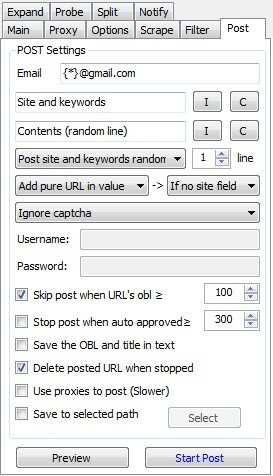 ;) Quickly filter lists to high PR and URLs with captcha to post manually only to valuable websites. How great is that? Not only comments post support! As you see, GScraper can post comment, but not only! To support the spin rule, and we add the * to create a random string. You just need input you websites, keywords and the comments. And, if the target URL form has no URL field, it dont't matter, GScraper will help you add your website into comments automatically! If you don't want to use your IP address to post, we also support proxies for you. Also, Gscraper support the CAPTCHA identification service, you can use such as imagetyperz to de-captcha,your post will be high success rate. PS: GScraper support all comments, guestbooks and any anonymous reply system. GScraper will save the auto approve blog list at posting, you can know which URL show your site at first time, and we kept save the text to differentiate your site is nofollow or dofllow in this URL. no need to check at finished. really, too easy. Auto approved list is not enough? now I think you need to use the expand. Expand can help you find the other can post pages in same domain from a URL, You can use expand found more and more auto approved URL. it not use the site command to Google, it like a search engine spider to open all in-site A tag and find the can post page, it's so cool. ADVANCED SEO TUTORIAL: sometimes we use the auto approve list from the web download, but the OBL of URL in list is a large number, because many many SEOer post comment to this list. 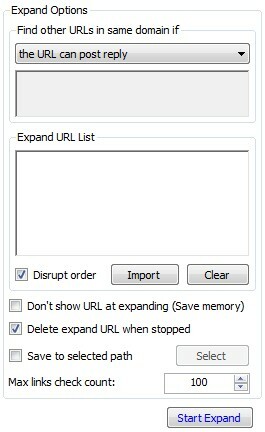 In this case, you can use expand to find the other can post pages, and delete the URLs if the OBL is so large. then post the other pages. 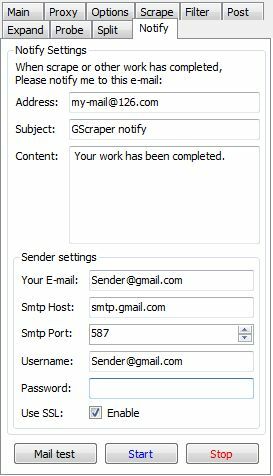 GScraper automatic notification for you by e-mail when the task is completed. You do not need to connect to your server/VPS at any time ! As you see, GScraper has this function, you can type/import your keywords, and scrape more and more related keywords. You can scrape from input box drop-down, or from searches related. And, the results according to preferred language, the mean is you can scrape you wanted language for related keywords! *- average speed determined on VPS server or local based computer with broadband network access. Screenshot was taken by software author on home PC with 20MB incoming connection (2013-01-10).